The top nuclear envoys of South Korea and Japan met Monday to discuss ongoing efforts to denuclearize North Korea amid tensions in the bilateral ties caused by historical and other sensitive issues. 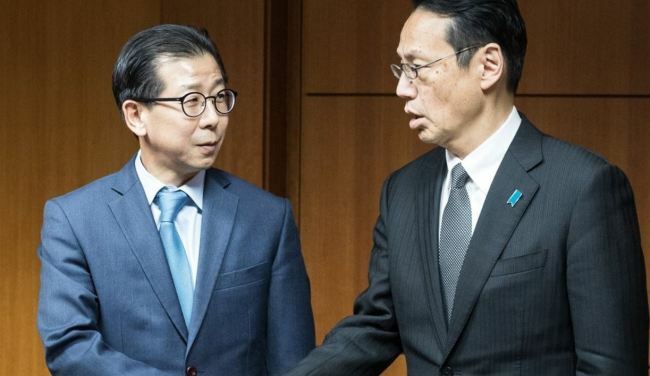 Lee Do-hoon, Seoul's special representative for Korean Peninsula peace and security affairs, held talks with his Japanese counterpart Kenji Kanasugi. Later in the day, Kim Yong-kil, director-general for Northeast Asian affairs at Seoul's Ministry of Foreign Affairs, will meet Kanasugi for talks over bilateral relations. Kanasugi also serves as director-general of the Japanese Foreign Ministry's Asian and Oceanian Affairs Bureau. Their talks come amid a spat over the recent rulings by Korea's Supreme Court that two Japanese firms should compensate Koreans forced to toil at their factories during World War II. Japan has strongly protested the rulings, saying all reparation-related issues were settled in a 1965 deal to normalize bilateral diplomatic relations. Tokyo colonized the Korean Peninsula from 1910-45. Tensions flared anew last week as Tokyo claimed that a South Korean warship directed its fire-control radar at Japan's maritime patrol aircraft Thursday. Seoul rejected the claim, saying Tokyo misunderstood its naval operation to help a North Korean ship drifting near a sea border in the East Sea.